QMotion's shading systems are designed with both form and function in mind. They are the only automated window treatment company in the market offering a patented manual override feature, allowing products to be operated by hand, remote or a smart device - an industry exclusive. 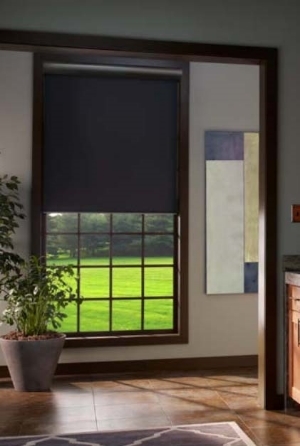 These automated roller shades are designed with a built-in safety stop braking system so they do not pass over the top when rising. The benefit of this is both protection of the motorized shade as well as protection of your walls and windows. QMotion's roller shade bracketing is slim and unobtrusive. This makes our motorized systems more attractive, but also reduces the side light gaps to a minimum of 1/2" on each side. The smallest in the industry. The QMotion Honeycomb collection provides a very elegant quiet solution to motorized shading. Unlike other motorized solutions, there are no exposed wires and battery wands. To access batteries, simply removed the snap on inside cover to replace the D-cell alkaline batteries located inside our headrail. Because all of our honeycomb shades are spring counterbalanced, the motors can move very easily and quietly. With this design, QMotion's cellular shades achieve a two to three times longer battery life than other automated honeycomb shades. QMotion's Motorized Drapery Rod collection is the latest innovation in automated window treatments. The first and only track-less motorized drapery rod in the market has arrived. The real beauty of QMotion's innovative new product is what you don't notice. We've removed the external motors and wires and placed a battery operated motor inside the hardware itself. Imagination, determination, and inspiration sparked the groundbreaking technology of QMotion's drapery rod system with Touch Wand Activation. The Touch Wand Activation feature provides customers with the convenience of manual and remote control. The Motorized Drapery Rod collection offers six beautifully crafted finial options and six popular finishes. Add your own draperies for a truly custom design experience. To learn more about QMotion, please fill out the form below.